Blog from Warrnambool, Victoria | Helen & Andy Travel Oz! Ok, so when we wrote our last blog we were still in New South Wales and as the bush fires were still burning we decided to stick around for a couple more days and give Victoria a chance to stabilize. We moved about 10mins south of where we were to another coastal town of Pambula. We spoke to a fella who had been staying in a small town in Victoria, one hour after he left the town was eaten by the fires. The news and stories were on every TV station, not surprisingly there were a few tears from us watching them, so it wasn’t a jolly time to be here. Still varying weather and we only stayed 2 nights so didn’t accomplish much, but as the pics will show we had great neighbours once again (in the South East Coast NSW photo album). We were warned on arrival by the people in the next pitch that the locals can get a bit cheeky! They had left there caravan open and when they returned there was a kangaroo in their van eating his way through three bananas, apparently he just put them half-eaten back on the worktop and jumped away! They certainly weren’t shy, nor were they clean! However, we figured we couldn’t stay there forever and we needed to get our travels back underway so we made the drive to Victoria. We arrived at a place called Lakes Entrance about 200km into Victoria and it was beautiful. Unfortunately the campsite we found only had an en-suite pitch so we had to have some luxury with a cabin on the edge of the pitch with full bathroom, such a shame! We took the van for a day trip to the Buchan Caves, similar to Jenolan Caves but in my opinion more impressive. They weren’t as visitor friendly though as we all had to bend over a lot to get through the tunnels, but the crystals and formations were beautiful. We moved further down the road and visited Bairnsdale and Paynesville, neither of which we found particularly appealing so we moved on, to Melbourne. Unfortunately we drove through the south of Melbourne, through the road works, the broken traffic lights and the distinct lack of any reasonable road sign or decent map. We were hot and very bothered by the time we’d turned around for the first time, after the fifth we were fuming! Eventually we found a site north of the city near a tram line that takes you straight to Melbourne. The city didn’t have the same ‘wow’ factor as Sydney but we managed to shop lots and sight-see less with one exception thanks to Taylor, the MCG! Melbourne Cricket Ground is the eighth largest ground in the world, seating over 100,000 people, so the tour guide told us! To be fair the tour was really well priced and took us to all the places you would never normally get to see, unfortunately the changing rooms were empty, as were the ice tubs and showers, damn! However, Taylor enjoyed it and it is well worth seeing, not as unbearable as id thought. When we left Melbourne we planned on visiting the street where Neighbours is filmed but it was too far out of the way for us so instead we headed west again. We took the less scenic route and landed in a town called Warrnambool, still on the coast and stunning. Over the road from us is the beach and just behind us is a number of lakes, the area is famous for its shipwrecks and the town heavily relies on this to attract tourists. There is even a small village that has been built where they set shows and tours to re-tell some of the stories. However we realised that the more scenic route from Melbourne was what we really missed out on, so we took a day trip and drove back along The Great Ocean Road for about an hour, well worth the drive. Unfortunately the day was overcast so perhaps we lost out on some of the beauty but we weren’t disappointed. About every 500m there is a lookout where you can park up and walk to view the coastline, to view the strange and spectacular coastline!! The coastline has been eroded away at various times and places along the road leaving arches and limestone islands. One lookout viewed London Bridge, where two arches were formed creating a bridge out to sea, one of the arches collapsed though leaving an island. 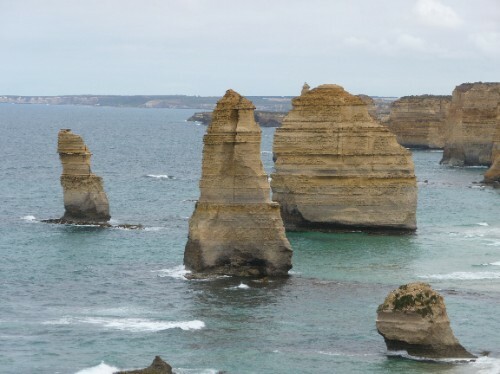 The most striking though had the be The 12 Apostles, where 12 limestone stacks remained away from coast. Some of them have collapsed over time but the others were staggered along the coast keeping watch over the sea, very impressive. We would have liked to view more of Victoria but as we are still getting fire warnings we aren’t able to head north to all the National Parks etc so we have pretty much flown along the coast. We have decided to head to South Australia starting in Mt Gambier and head towards Adelaide so we’re leaving Victoria tomorrow.